For years mothers have been told to avoid peanuts during pregnancy as they may increase their child’s risk of developing peanut allergy. This recommendation has recently been revised by the Department of Health as the evidence was found to be inconclusive. In fact, new research shows that just the opposite may be true. A study published in Food Research International showed that maternal consumption of peanuts in mice could increase tolerance of the nut in offspring. This study supports evidence that the environment in the womb has a strong effect on a child’s immune system. This study is an important breakthrough considering the ever-increasing prevalence of children who suffer from the peanut allergy and unlike other allergies, can continue into adulthood. With many new studies showing that what mothers eat during pregnancy influences a baby’s growth and development, it makes sense that early exposure to allergens can have an effect on a child’s future risk of developing allergies. The latest research suggests that earlier, more frequent and larger consumption of peanuts during pregnancy and the first year of life are associated with a low prevalence of peanut allergy. Fortunately, this increasing trend may be reversed in the near future as more follow-up studies are carried out. Not only is this research good news for woman who already enjoy eating peanuts, but it could also promote more women of childbearing age to obtain the great source of nutrition that peanuts can provide! Besides being a very good source of antioxidants and monounsaturated fats which decrease risk of cardiovascular disease, peanuts are a good source of folate, a very important vitamin that prevents birth defects in the beginning stages of pregnancy. 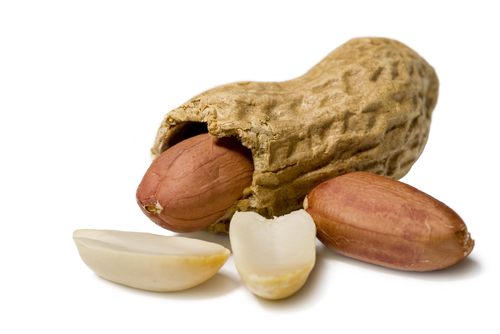 Also, when paired with a grain such as bread or rice, peanuts can contribute a complete vegetarian source of protein. The current recommendation from the Department of Health is that pregnant women may chose to consume peanuts as part of a healthy balanced diet, unless they themselves are allergic or a health professional advises them not to. With research showing that peanuts can’t do harm and may even be beneficial during pregnancy, women can rest assured knowing that this nut can be included in their daily diets- and that’s a GOOD nut to crack!